Lincoln will look to snap their three game losing streak as the Stars invade the Cedar Rapids Ice Arena to play the Roughriders. This will be the third time the Stars and Roughriders have played each this season. The Roughriders lead the season series, 2-0. Lincoln goaltender Kevin Murdock is 0-2 against the Greeny Weenies Roughriders this season, while sporting a respectable .907 save percentage, and a 2.56 goals against average in those two games. Lincoln and Cedar Rapids are polar opposites in terms of penalties called against each team. The Stars lead the USHL in penalty minutes with 1,412 in 52 games. The Roughriders are last in the USHL in penalty minutes with only 573 in 52 games. That's an incredible discrepancy, in my opinion. Almost 1,000 penalty minutes separate the two teams. Cedar Rapids always seems to put out extremely disciplined teams year in and year out in the USHL (they were last in PIM's last season as well). Some fans of other teams like to suggest that CR has an unfair advantage in terms of the calls (or lack thereof) against them. Well coached, disciplined team? Or a favorite of the refs? I really don't have an opinion either way. Personally, I think they play boring hockey, but it wins games. That's the ultimate goal, correct? The last time these two teams faced off against each other, it turned into a gongshow in the third period. In Cedar Rapids, the Stars were losing 2-0 at the second intermission. At the 1:41 second mark of the third period, it all went nuts with a line brawl. Five Stars players received fighting majors, while only three Roughriders players received fighting majors. I always thought you had to have two players fight each other to get a fighting major, but I digress. There was talk after the game that the CR players were talking a lot of smack during the game, but not really backing it up physically. Whatever the case was, the Stars lost a very close game. I don't know if the fireworks will carry over to this game, but it could very well happen. 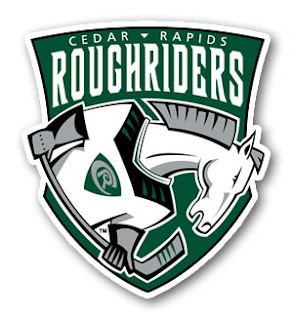 Cedar Rapids is coming off an uncharacteristic home loss Saturday night by the hands of the Sioux City Musketeers, so they will be playing their best. The stupid penalties have to be eliminated in this game. I know that the Stars seem to get the short end of the stick in terms of calls against them when playing East teams, but they're going to have to learn to get past that. The Stars will not win this game if they spend the entire game shorthanded. Stay out of the box, hit 'em hard, and work like crazy to get those dirty goals. Drastic times call for drastic measures. 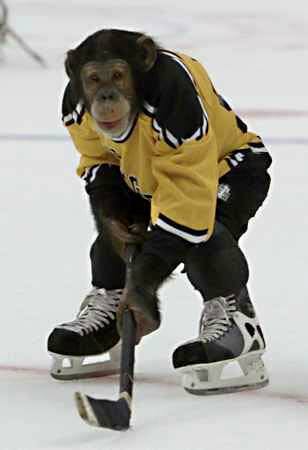 I'm going to post a picture of "Jack," the monkey from the film "MVP" (Most Valuable Primate), the worlds most famous (and only) hockey monkey, in hopes his hockey monkey mojo can break this losing streak. Go Stars. HOCKEY MONKEY MOJO LIVES!! I'll post a recap tomorrow. Great win though. Nice to see the Stars finally outshoot a team, and stay out of the box. Quality road win against a very good team. I assume the monkey will be making a return appearance Tuesday!? No, no. Hockey Monkey Mojo is only brought out in special situations. Otherwise, he gets cranky. Current Poll Question - Team MVP? B2 Public Events in Lincoln? ?